Almost 300 people have signed up to take part in Row The Tyne, a very special rowing competition in aid of the Sir Bobby Robson Foundation involving no boats – and no wet feet. Using Concept 2 rowing machines, 50 teams of up to six people will be challenged to row a massive 118,000m in just 10 hours. It is the distance from the source to the mouth of the River Tyne and entrants will need to achieve an average pace of 2:30 minutes per 500m. Row The Tyne will be held at Royal Grammar School in Newcastle on the 10th February and is sponsored by Tri Construction and a host of local businesses. Every team place was snapped up in just three days and event organiser, Joel Dickinson, is absolutely thrilled by the positivity it is generating – and the funds it is raising for a charity that is close to his heart. Joel, from Hexham, is organising the event alongside friends Dave Shenton and Jamie Walton. Joel says: “As someone who’s been through cancer, this event is hugely important. I feel as if I’m giving something back to the system that helped me so much at the time. “And to see everybody come together to help, and to realise how important Row The Tyne is to other people, too, has been quite overwhelming. “We wanted to do something that could involve as many people as possible. And something that meant you didn’t need to be an expert in a particular field of sport or exercise. Joel was ‘stopped in his tracks’ in February 2017 with a shock diagnosis of Oropharyngeal Cancer on his tonsil and associated spread to the lymph nodes in his neck. He received three individual bouts of surgical treatment including Trans Oral Robotic Surgery at the Freeman Hospital in Newcastle. Through the expertise of internationally-renowned surgeons, access to world class specialist equipment and unrivalled nursing care, he was lucky enough to be given the all clear in May last year. 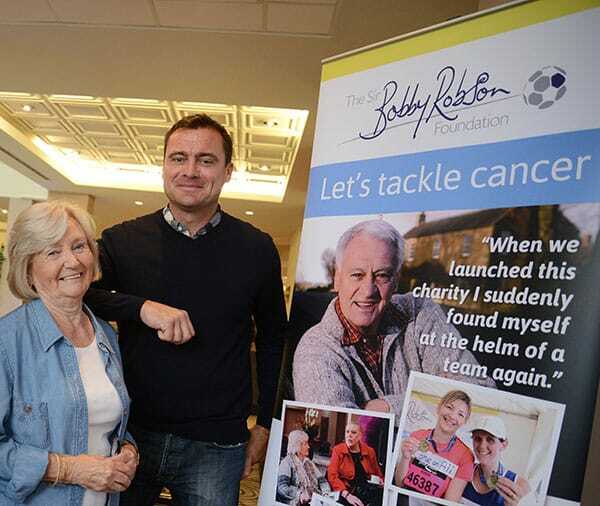 Joel adds: “I was completely overwhelmed by the quality of treatment and care I received at the Freeman Hospital and raising funds for the Sir Bobby Robson Foundation is my way of saying thank you. “We’ve been staggered by the positive response to our fundraising. So many people have offered to provide equipment and raffle prizes and just wanting to do something to help. “The Row The Tyne teams mainly consist of six people and it’s going to be a long day for them. Not just physically doing the rowing, they’ll need to support each other when it gets tough. We’ve got some DJ’s coming along and there’ll be a fantastic atmosphere. Row The Tyne will begin at 8.30am on Saturday 10th February at Newcastle Royal Grammar School in Newcastle, with entrants arriving at 7am. The prize-giving is provisionally planned for 6.45pm and it will be followed by a celebration event at the Tyne Bank Brewery in Newcastle. To make a donation, please visit: https://www.justgiving.com/fundraising/rowthetyne and please follow @RowTheTyne on social media.